Cebu, Philippines. 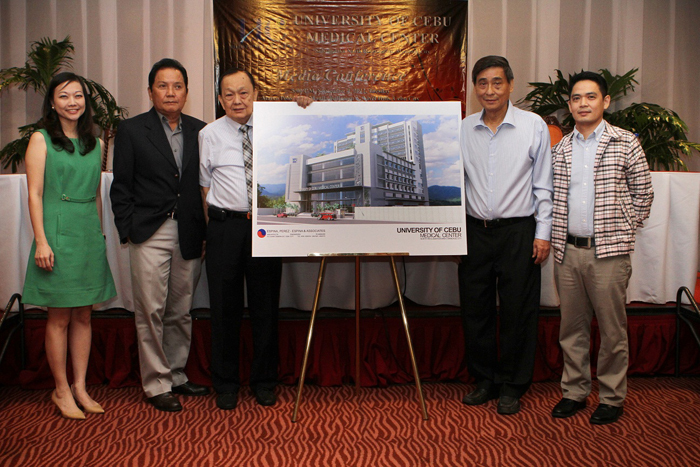 The University of Cebu is all geared up to construct its very own University of Cebu Medical Center. The Department of Health has approved a Permit to Construct the University of Cebu Medical Center (UCMC), a Level 4 General Hospital to be located at the North Reclamation Area, Subangdaku, Mandaue City, Cebu. The approval, which passed through the Health Facilities Establishment Review Committee, was stated in a letter addressed to University of Cebu President Atty. Augusto W. Go dated July 30, 2012 from the office of DoH Secretary Dr. Enrique T. Ona, FPCS, FACS. A Level 4 Hospital, as defined the National Center for Health Facilities Development, is a teaching and training hospital that provides clinical care and management on the prevalent diseases in the locality, as well as specialized and sub-specialized forms of treatment, surgical procedure and intensive care. A General Hospital, likewise, is defined as a hospital that provides services for all types of deformity, disease, illness or injury as determined by the Department of Health. The University of Cebu Medical Center, which will span across an 8,000 square meter property at the Mandaue NRA, will be the first Level 4 Hospital in Mandaue City. An initial investment of Two Billion Pesos is allocated and sourced by the University of Cebu towards the construction and completion of the UC Medical Center. Thus the University of Cebu Medical Center will soon fulfill the institution’s commitment to provide quality but affordable education and medical services establishing a medical school and medical hospital for the UC System. The hospital will link with all the UC schools and campuses, including the 10,000 plus merchant marine students who will need medical accreditation and attention for foreign ship deployment and the medical and nursing students for their training and employment, plus the rest of the 34,000 students for their medical needs. The families of all UC students and alumni will also be UCMC’s natural market as they will be entitled to special discounts as part of the UC family. It may be recalled in 2008, the University of Cebu-Banilad and its partners purchased the St. Vincent General Hospital (SVGH). Since then, the hospital has been accredited by PhilHealth as a tertiary hospital with a 100-bed capacity. The original 6-storey building was given an extensive renovation and in 2010, an adjacent 7-storey building was completed and opened to accommodate a growing number of patients. Like UC, St. Vincent General Hospital is structured to provide quality but affordable medical services to the community.